THIS GIVEAWAY HAS NOW ENDED. THE AUTHOR SELECTS THE WINNERS AND CONTACTS THEM. Enter to win the first three books in the Stranje House series. 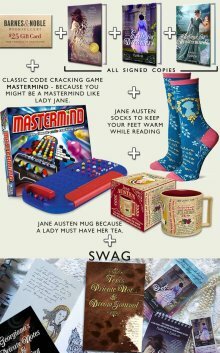 Plus a $25 Barnes and Noble Gift Card, Swag, Jane Austen Items and the Mastermind Code Breaking game. The books will be signed!